Clearing out my apartment in London I decided to go for a cycle around Harrods just to soak up the extravagances one last time. The array of supercars made me wonder why I was moving back to Ireland where an Audi R8 is a serious contender for the most exotic car in the land. London is great for car sightings in general but the sheer volume of cars around today made me feel slightly unnerved, I mean there were millions of pounds worth of machinery, some painted in ghoulish colours just to really emphasise how little the owners care for financial concerns such as resale value. 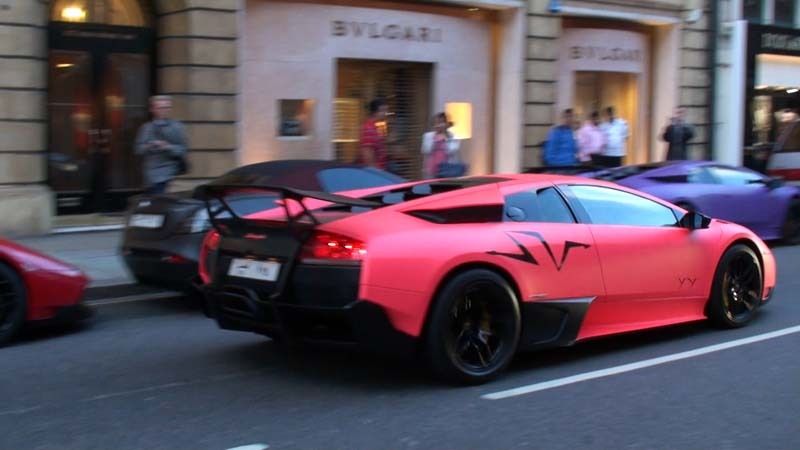 For example; check out the pink Lamborghini SV in this video: http://www.youtube.com/watch?v=ZbB1RwpuTRY To be honest I quite liked the pink Lambo, after all absurdity is what that brand is all about, but you get the idea. And I can't say such excess is vulgar because everybody who saw these creatures (including me) was enthralled by the spectacle of it all. Although the souped up Porsche Panamera FABDesign was unfortunate. Here's some of the cars I saw: Ferrari F355 Cab, F430's, F430 16M, 456GT, Enzo, 458 Italia, California's, RR Cab, Spyker, Bentley Shooting Brake, Brooklands, Lexus LFA, Bugatti Veyron, Koenigsegg CCXR "Special One", Lamborghini Reventon, SV's and plenty of Aston Martins. It's all over now but if I need a dose of motoring exotica I know it's just a cross the pond in Knightsbridge where a flight would cost about the same price as a ticket for the RDS "car show".